I would love to be the owner of a home with 3.6m high ceilings, great feature windows with even greater architraves and original wooden flooring, but I’m not. We bought a tiny cottage and added (on a budget), added again (thankfully on a higher budget), but it’s still a fairly standard home, there are times when armed with my camera I wish it was bigger (or I was smaller) or that those windows weren’t quite so aluminium and the floors were in fact original, battered and bruised with a lifetime of footsteps. 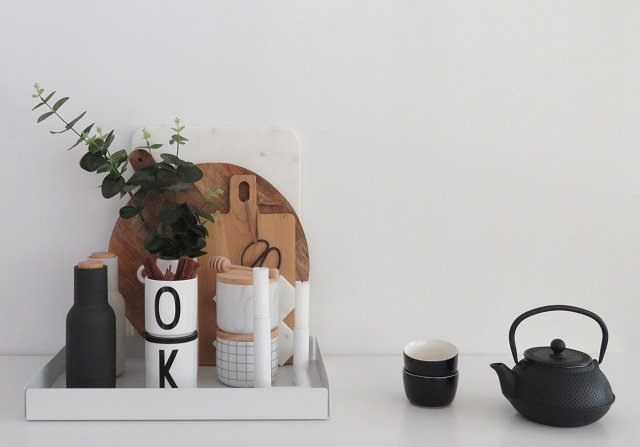 But there is good news; even the most basic home can look beautiful with a little titivating, its the little things you do that can set your home, large or small, old or new, architecturally designed or kitset, apart from the rest. 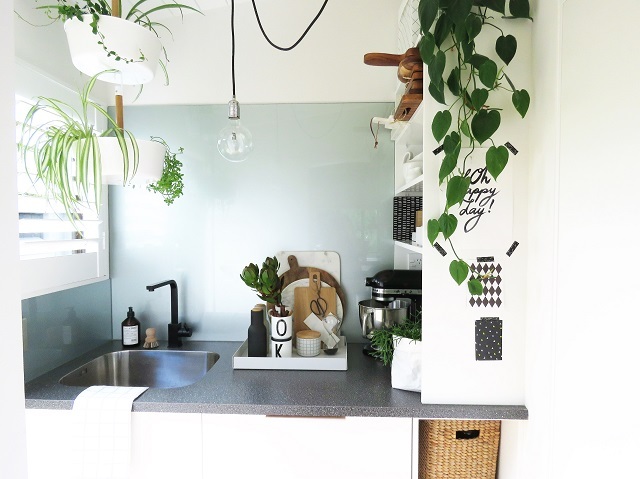 Over the next few weeks we will tour around mylittlehouse and I’ll show you a few stylist tricks to transform spaces with the simplest of additions. Let’s start with hub of the home; The Kitchen. It amazes me how guests gravitate there and stay there, hours pass and my feet are aching standing kitchen side while they sit island side, next time I will be forcibly removing them to a more equal area of comfort! My little kitchen is over ten years old and really I would like to upgrade it, but with a pool going in early in the New Year and a whole lot of landscaping to be paid for I think my new kitchen will be a while away. Luckily 10 years back I decided to shun the beige with red accent theme which seemed to be dominating the kitchen world and went for white. Thankfully, I ignored the 50ml benchtops that were being pushed my way and opted for the standard 30. The ever popular curved handles I avoided and went for a sleek simple style and, thank the lord there was no bright splash back involved. So, a side lesson there, to avoid trends that you cannot un-trend very easily. I try to keep my island clear, as that is the space I use as my main worktop. I have a scullery area where the appliances are stationed meaning that I don’t need anything ‘functional’ displayed in the main kitchen area. I do however like the salt and pepper grinder at the ready as well as chopping and serving boards near the stove top. 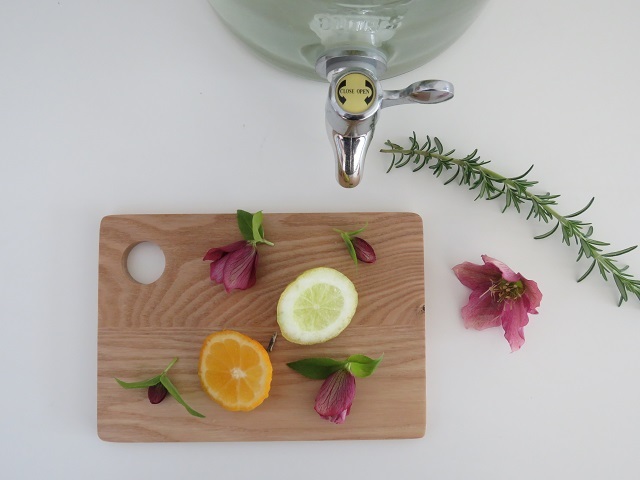 Lucky for us that chopping boards and salt and pepper shakers are simply beautiful these days! 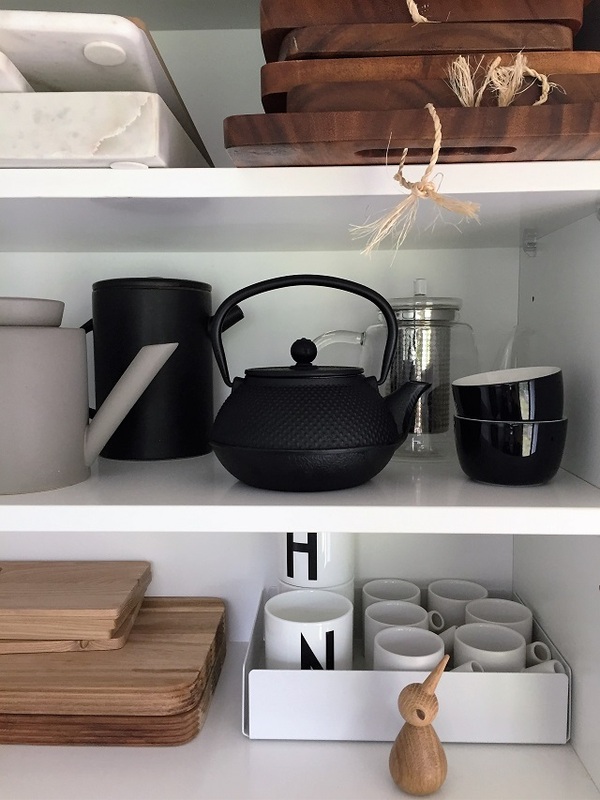 Open shelving can be beautiful, it can also be a nightmare; my scullery shelving faces outward so is not visible from the kitchen which works well. The best way to contain all your bits and bobs is within a tray, this gives you a solid base in which to build your vignette, wooden trays can look great but if you want a sleeker look a painted or metal tray is perfect, if you want something luxe a marble tray is unbeatable. Invest in good quality S & P grinders, not just for their looks but their function. A couple of lidded canisters can hide things that you may not want seen. 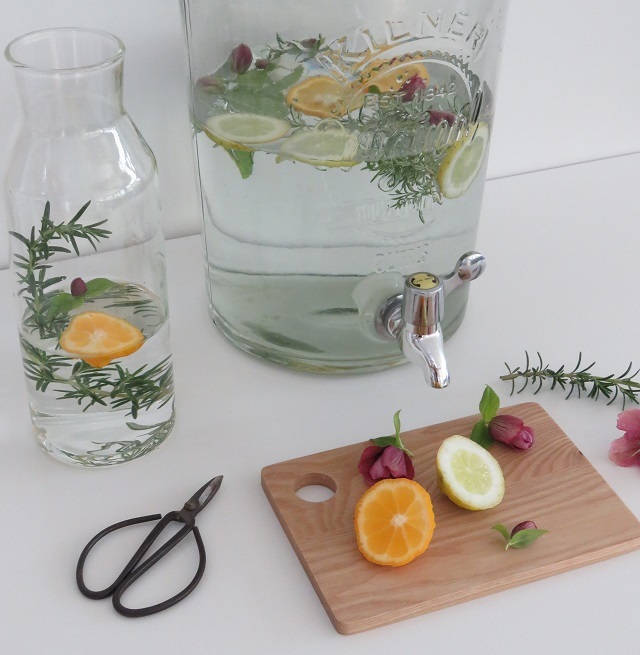 Don’t be afraid to have a plant or vase of cuttings or flowers on your benchtop, I haven’t had a lot of luck keeping herbs alive indoors, but if you use them often take cuttings and pop in a jug of water. 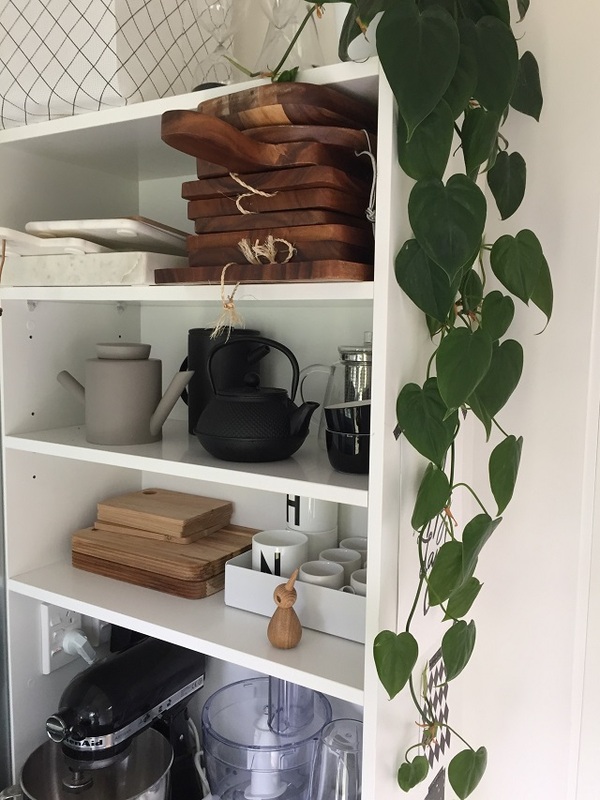 Chopping and Serving boards provide height so go ahead and lean them up against your splash back. A jar of utensils or knives can be handy. Should you own a beautiful mixer or a funky coffee machine go ahead and plug it in, those things are made to be admired as well as used. 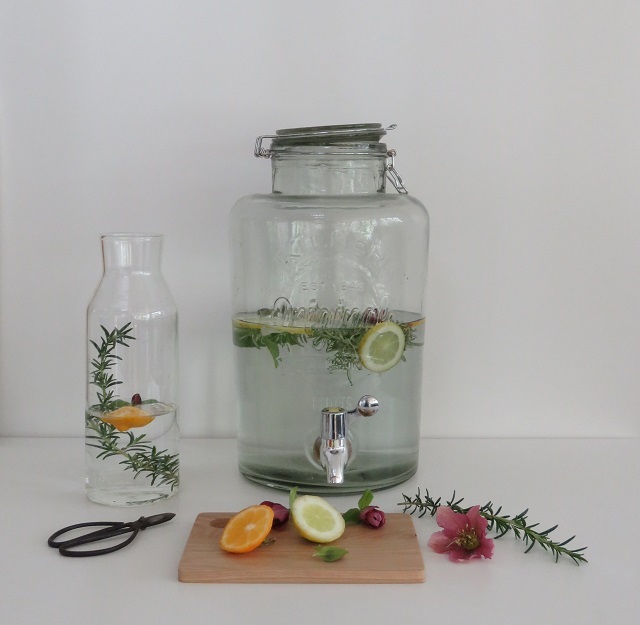 In summer a Water Decanter is perfect, if you fill it with water, herbs, citrus and flowers you will have a thing of beauty literally begging you to drink it. A new paint job, handles or benchtop can also make the world of difference. 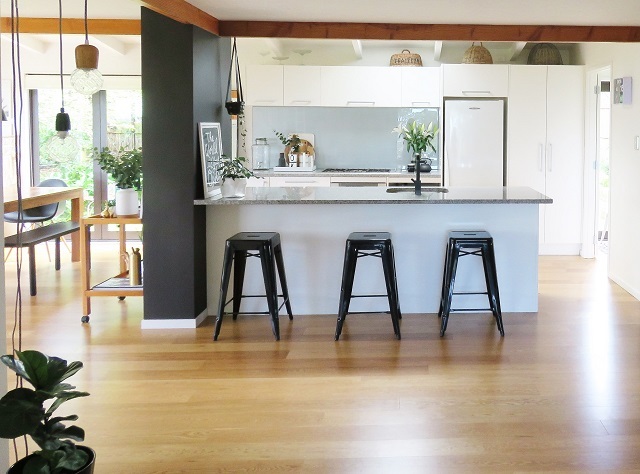 If you are looking for a new kitchen take a look over at K&F Kitchens I have had the pleasure of working with them!